Mages' Home, Book 1 of Defenders of the Wildings, is now available! 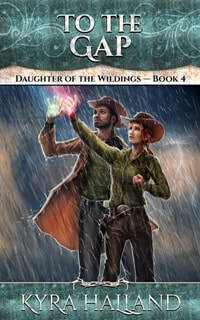 Read the first three adventures of Silas Vendine and Lainie Banfrey, magical bounty hunters, in this value-priced box set. 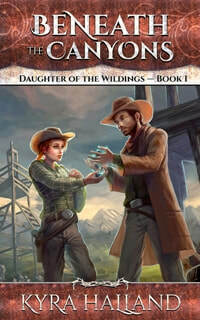 Contains Beneath the Canyons, Bad Hunting, and The Rancher's Daughter. A gunslinging mage. A rancher's daughter with a deadly secret. And a renegade wizard with the power to destroy them all. Lainie Banfrey has been taught all her life that wizards are unnatural creatures with no heart and no soul. If anyone finds out she has magical powers, she could end up on the wrong end of a hanging rope. 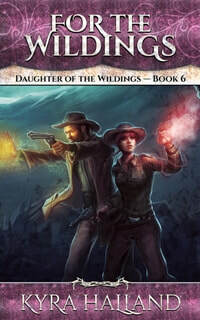 But when a gunslinger shows up searching for the man who has brought Lainie's hometown to the brink of open warfare, she learns that they share the same secret and agrees to help him. As they find themselves falling for each other - an attraction forbidden by the strict laws of the Mage Council - Silas and Lainie must find and stop the renegade mage before the dark power he has unearthed destroys everyone who makes the Wildings their home. Beneath the Canyons cover art reveal! Once a hunter of renegade mages, now he's the one being hunted. Silas and Lainie have defeated the dangerous rogue mage who brought Lainie's hometown to the brink of open warfare. But the town of Bitterbush Springs isn't big enough for two wizards, or even one, so they've hit the trail. Married now and on the wrong side of the mages' law themselves, they just want to find a good bounty and stay out of trouble. Then Silas gets word that another mage hunter down in the dry and desolate Bads is onto something big and needs backup. The money is good, and Silas can't turn down a fellow hunter in need, so he and Lainie head into the badlands, only to discover one mage hunter dead and another one missing. And if they can't find the killer hiding in the vast, trackless desert, Silas could be next. Once a hunter of renegade wizards, Silas Vendine now finds himself on the wrong side of the mages' law with his illegal marriage to Lainie, who has her own forbidden and supposedly impossible magical powers. On the run from the law, Silas and Lainie are scraping by on what Lainie wins at cards and whatever odd jobs Silas can get from people who need his skills and don't ask too many questions. When Lainie's luck with the cards turns sour, they are led to a meeting with one of the richest ranchers in the Wildings. Brin Coltor wants Silas and Lainie to undertake a dangerous mission into A'ayimat territory for him, and they can't afford to turn him down. But Coltor is hiding a few secrets of his own, that lead Silas and Lainie right into the trouble they've been trying to avoid. The secret of Lainie's forbidden magical gifts has been exposed, and Silas wants to take her far away from the Wildings to a place where she can be safe. To earn money for the journey, Silas signs them up to work on the big annual cattle drive to the Gap. Lainie dreams of making the Wildings into a place where she and Silas and other mages can live in peace. 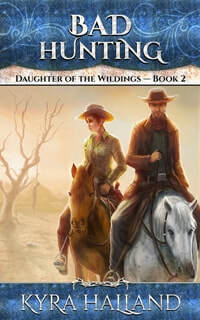 The cattle drive is the perfect opportunity for her and Silas to show the Plain settlers of the Wildings that not all mages are wicked, heartless monsters. While Silas has reason to believe that the danger to Lainie is worse than he thought, Lainie can't agree that leaving the Wildings is the answer. As they travel with the herd, trying to avoid discovery by mage hunters and the mage-hating Plains while protecting the herd from renegade mages, they must make a choice - do they seek refuge in a faraway land or stand and face the dangers of being outlaw mages in the Wildings? - before the disagreement tears them apart. A nightmare come true - Silas is captured by mage hunters. 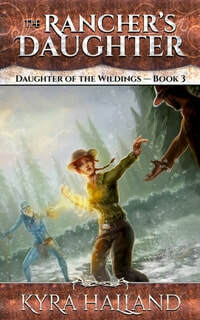 Determined to rescue the man she loves, Lainie braves the perilous crossing through the Gap to follow him and his captors into the mage-ruled land of Granadaia. Silas and Lainie recover from their ordeal in Granadaia, while knowing that an evil is at work that threatens the freedom of the Wildings and that this peaceful interval is no more than a brief illusion. Then the unthinkable happens, the battle begins, and Lainie, the daughter of the Wildings, and Silas, the man she has claimed for herself and for the land, have to draw on all their power and strength - and on the life of the land itself - to protect their beloved Wildings and the people who make it their home. 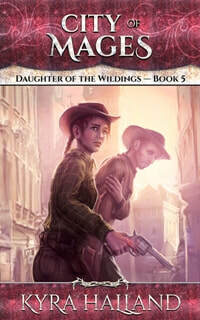 Now available: Daughter of the Wildings Books 1-6: The Complete Series. Get the whole series in one handy box set! 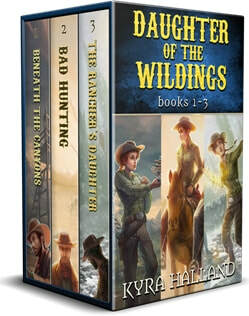 Includes all 6 books: Beneath the Canyons, Bad Hunting, The Rancher's Daughter, To the Gap, City of Mages, and For the Wildings, plus two Silas and Lainie short stories: Home on the Range and A Good Example. Note: due to Amazon's pricing restrictions, this set is NOT available at Amazon. To get it for your Kindle, purchase it from Smashwords, download the .mobi (Kindle) file to your computer, then use the Send to Kindle app to wirelessly send the file to your Kindle device or app.